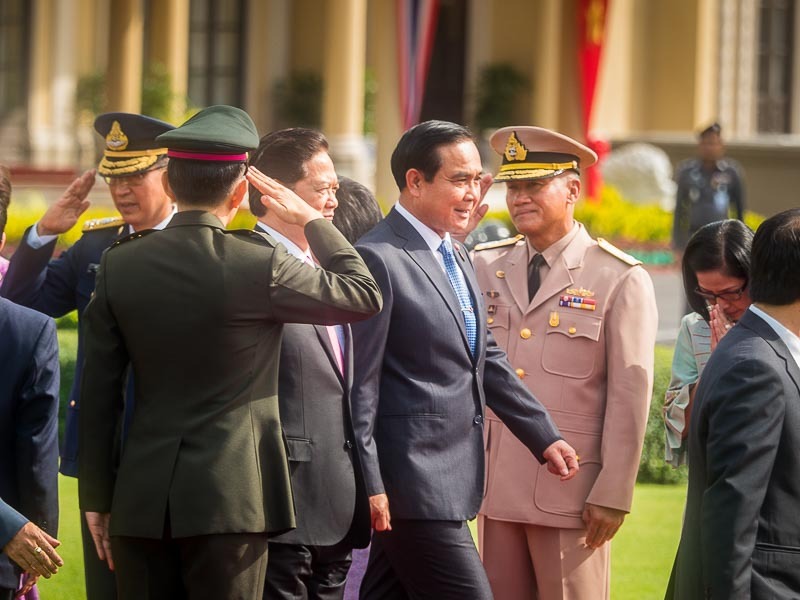 NGUYEN TAN DUNG (center, foreground), Prime Minister of Vietnam, and PRAYUTH CHAN-O-CHA, Prime Minister of Thailand, (left) review soldiers in the honor guard at Government House in Bangkok. 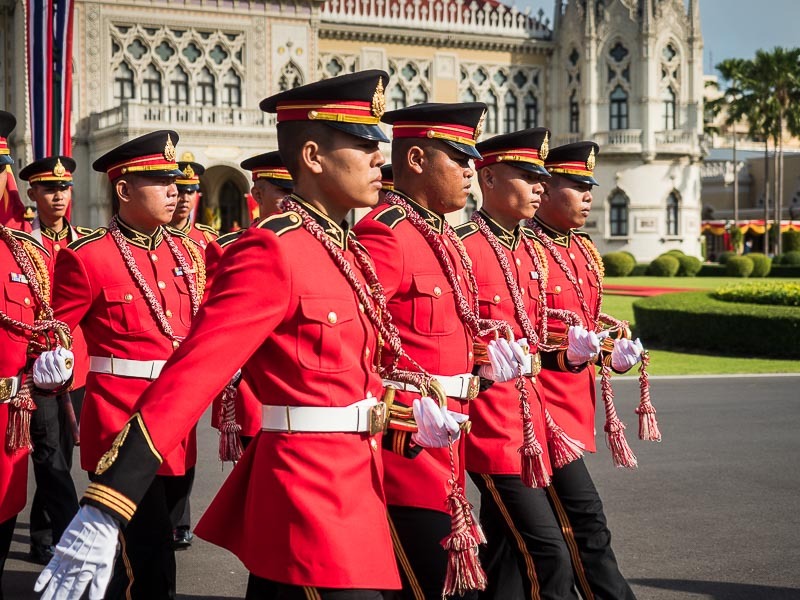 Thailand and Vietnam have a complicated history. 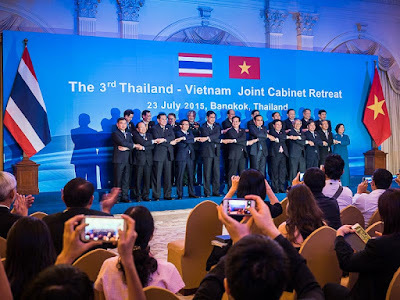 Thailand was an ally of the US during the Southeast Asian wars, Thai troops were a part of the alliance that fought in South Vietnam (with South Korea and Australia) against the North Vietnamese and Viet Cong. The US Air Force used bases in Thailand to launch air strikes against targets throughout Southeast Asia. After the Americans left, Thai and Vietnamese forces faced off on the Cambodian and Lao borders. Thailand (and the US) supported the Khmer Rouge when Vietnam invaded Cambodia to get rid of the KR. Thai and Vietnamese forces along both the Cambodian and Lao borders traded shots several times in the 1980s. That was then and this is now. Now, the two countries are friendly rivals. 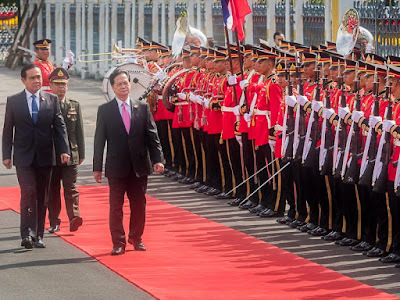 Thai Prime Minister Prayuth Chan-O-Cha leads his Vietnamese counterpart to the reviewing stand past the welcoming party. I went to Government House to photograph the welcoming ceremony and joint press conference for Nguyen Tan Dung, the Vietnamese Prime Minister. 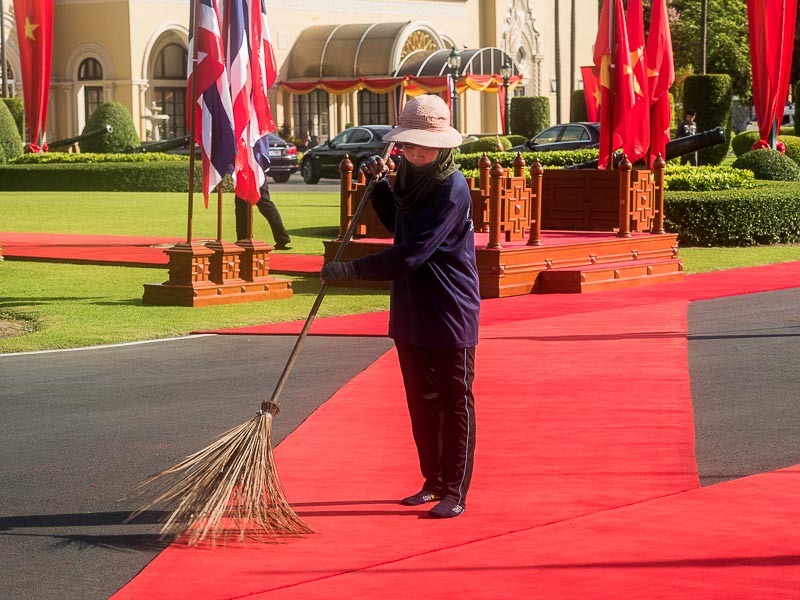 A groundskeeper sweeps the red carpet the Prime Ministers will walk before they reviewed the troops at Government House. Thai soldiers march into formation at Government House for the welcoming ceremony. These ceremonies are all about the pomp and circumstance. 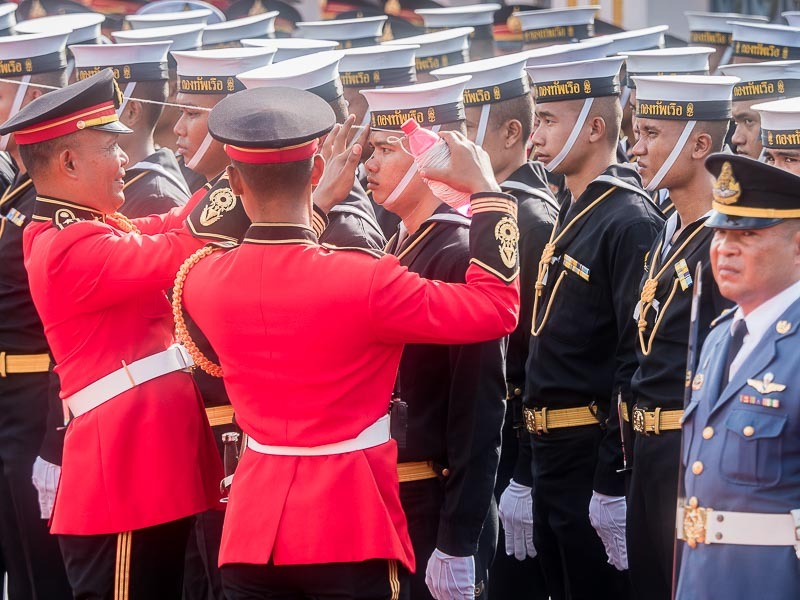 Soldiers (and sailors) are lined up in perfect order. Covering an event like this is not something I do very much anymore. I spend most of my photography time now wandering around in neighborhoods and communities documenting people's lives, not so much documenting the lives of the 1%. It was good to get back into the groove of that sort of insider photography again. After the welcoming ceremony we went into the event room at Government House for a signing ceremony between Vietnam and Thailand. 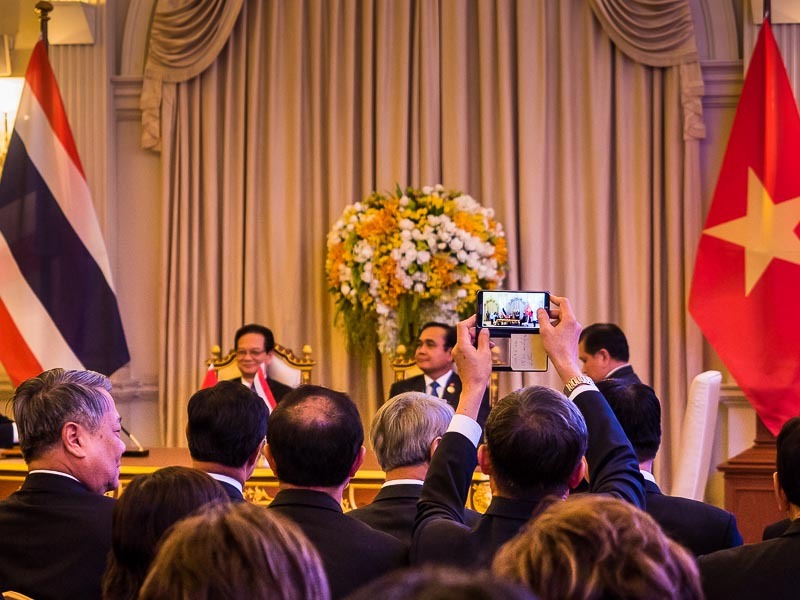 A member of the Vietnamese delegation used his smart phone to record the event. 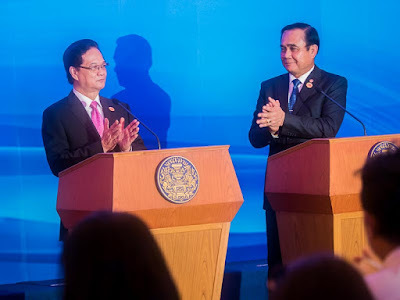 Vietnamese PM, Nguyen Tan Dung (left) and Thai PM Prayuth Chan-O-Cha congratulate each other at the end of the ceremony. The flash came from another photographer's flash. I was working with my E-M5 Mark II bodies at very slow shutter speeds. This is ISO3200, 1/50th of a second at f4 with my 40-150 f2.8 zoom and 1.4X teleconverter. The Thai and Vietnamese delegations pose for the official photo. The flashes here were also provided other photographers. 1/50th at f2.8, ISO 400. 12-40 f2.8 zoom, around 22mm (44mm on full frame). 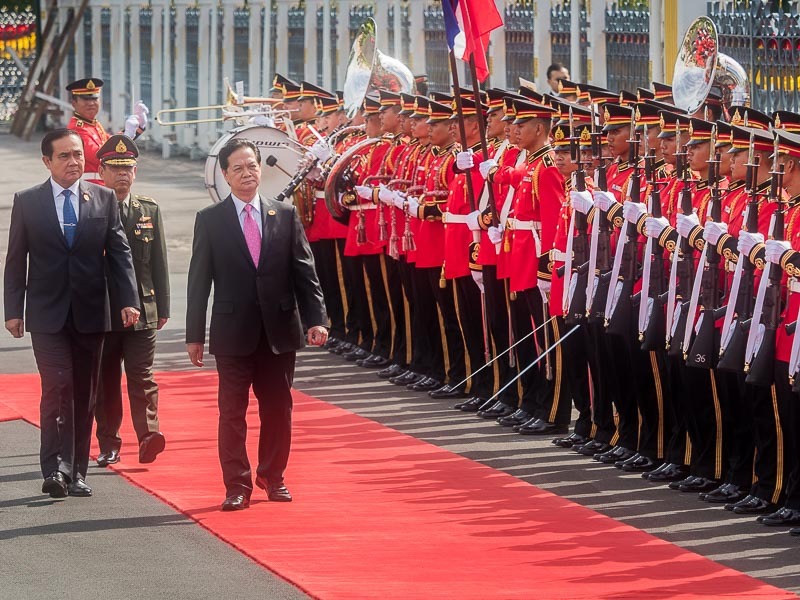 There are more photos from the Vietnamese PM's visit in my archive or available from ZUMA Press.